Blog Post St. Francis Winery & Vineyards...Breathtaking! We love St. Francis Winery & Vineyards. This stunning Sonoma Valley, California winery was voted #1 Restaurant in America by "OpenTable" in 2013 and #1 Best Place to Get Married by The Press Democrat in 2014. St. Francis Winery is known not only for its superb wines but also its stunning grounds and breathtaking vistas. We recently visited St. Francis for an afternoon tasting. Wouldn't you love to have a glass of their Zinfandel while taking in this view? Next time you’re in Sonoma County plan a visit to the tasting room and gift shop for sweet treats, gorgeous home decor, books, gifts and lots of wine accessories, including our Wine Glass Writer. Be sure to "like" St. Francis Winery on Facebook to get the latest news about their wonderful wines and fabulous events! 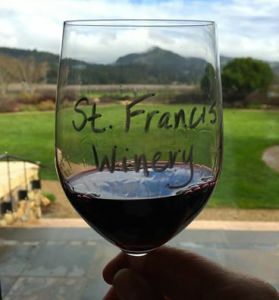 Have you had the pleasure of visiting St. Francis Winery? Update February 27, 2015: We are saddened to learn that St. Francis founder Joe Martin, nicknamed the "Father of Merlot Madness," died yesterday after a long illness. Read more about Joe Martin in this beautiful tribute to him at WineBusiness.com.